Authentication has always been the core of Auth0. But once you know who your users are, you’ll probably also need to know what they can do. Therefore, after authenticating users, you’ll need to authorize them. There are so many different ways to do this, from complex products to home-grown solutions. Using our rules engine, you could also consume this information during the login process. Groups are collections of users. They are a common way to organize users in enterprise directories like Active Directory. A company might create a group for every department, such as HR, Finance, Accounting, and IT. Users can be added to one or more groups. But groups can also be nested, with members of one group automatically added as members of another group. The main reason for having groups is that it allows us to group people who have the same profile within the company. It is easier to assign roles and permissions to groups than it is to individual people, who can can get sick, go on vacation or leave the company. While groups are bound to an organization and not an application, the same is not true for roles and permissions. These permissions only make sense within the application. A generate:invoice permission might make a lot of sense in your accounting application but no sense at all in your planning tool. Therefore, permissions represent actions that you can execute as a user within an application, and roles are there to group these permissions into logical collections. A timesheet application can have a Timesheet User role and a Timesheet Manager role. 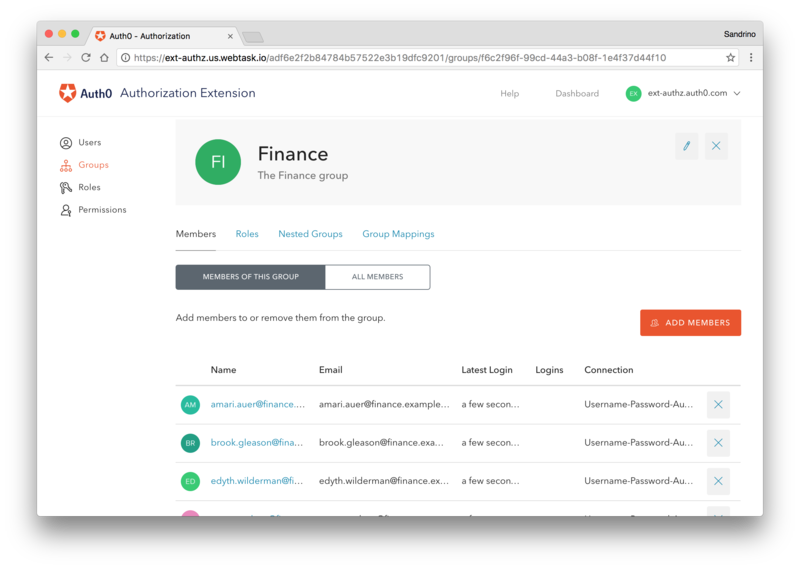 A user will have certain permissions, such as read:timesheets update:timesheets, and create:timesheets, while a manager will have additional permissions, such as approve:timesheet and reject:timesheet. These roles can be assigned to specific users or to groups; if roles are assigned to a group, every user of that group will receive those roles (and permissions). In the configuration section, you can configure the behavior of the extension. 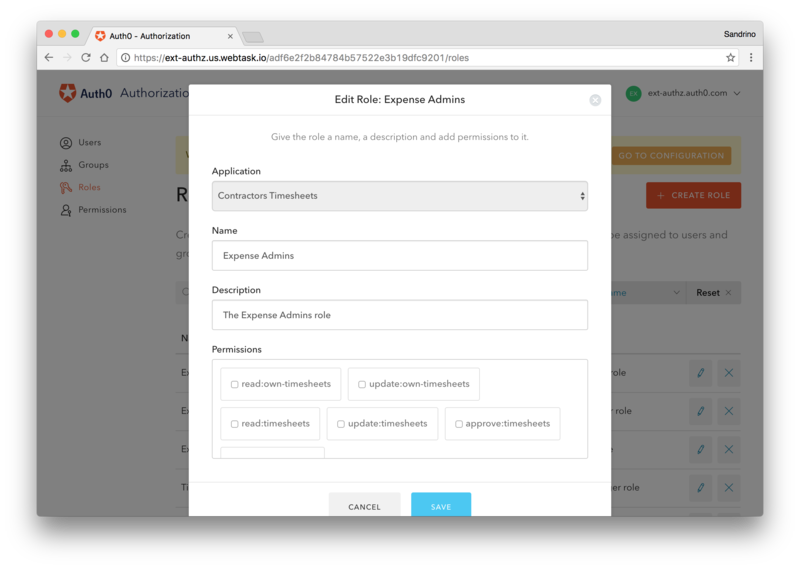 Any change you make here will deploy a rule to your Auth0 account, which will add the information to the token, the app_metadata, or both. This extension was built using React, Redux, Hapi, and Webtask. When you install it, the entire application will run in the Webtask container of your Auth0 account. The full source code is available at https://github.com/auth0/auth0-authorization-extension. Feel free to open a GitHub issue if you have any feedback. 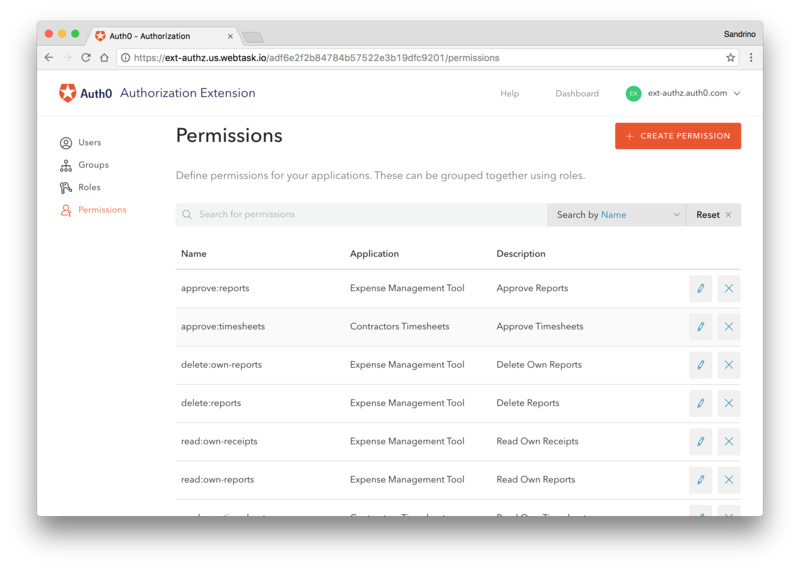 Our API authorization feature has been in public preview for some time now, and it will be interesting to use the authorization extension in that context. Depending on your use case, your permissions can be represented as scopes in your access token.